A guy from the Great Lakes state who loves watching & reviewing movies. "My wife's name is Felicia, my daughter's Sydney, & I will see them again!" That's a great & determined quote from Mark Wahlberg in Deepwater Horizon, a great action-thriller about one of the worst disasters in recent memory. The film is based on The New York Times article Deepwater Horizon's Final Hours by David Barstow, David Rohde & Stephanie Saul. 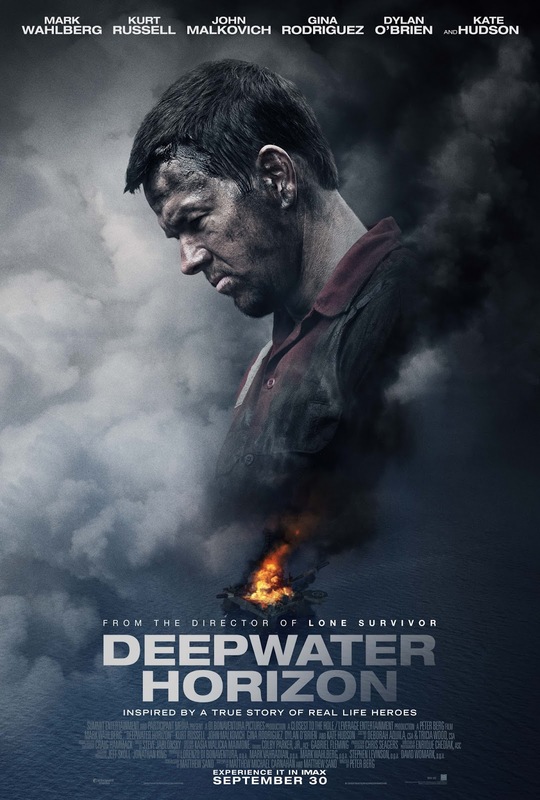 Wahlberg plays Mike Williams, a chief engineering technician on the Deepwater Horizon. He has a wife, Felicia (played by Kate Hudson) & a daughter, Sydney (played by Stella Allen). He leaves on a helicopter to go to the oil rig, Deepwater Horizon, in the Gulf of Mexico, about 40 miles off the Louisiana coast. While on the rig, he meets with Jimmy "Mr. Jimmy" Harrell (played by Kurt Russell), the boss of the rig, & Donald Vidrine (played by John Malkovich), a BP representative. Williams & Harrell are concerned with the fact that certain stability tests were not performed, but Vidrine tries to reassure them that everything is fine. However, that night, an explosion occurred, eventually causing the rig to be engulfed in flames. Now, Williams, Harrell, Vidrine, & crewmembers Caleb Holloway (played by Dylan O'Brien) & Andrea Fleytas (played by Gina Rodriguez) must try to survive. The cast, especially Wahlberg, Hudson, Russell & Malkovich were great. Peter Berg's direction is great, along with the screenplay from Matthew Michael Carnahan & Matthew Sand. The editing by Colby Parker Jr. & Gabriel Fleming was excellent, & the cinematography from Enrique Chediak was amazing. Although there were some missteps with the film, it is still a great action-thriller. Who Is The Michigan Movie Guy? The Michigan Movie Guy is Cameron Kanachki, a young aspiring writer & director who spends his spare time watching movies, listening to music, & following baseball.